Just like last week, "A My-Life Christmas" continues with an all-new strip!!! I'm glad this one went unpublished, since as I said before it was written as a possible "sacrifice" in case space didn't permit. 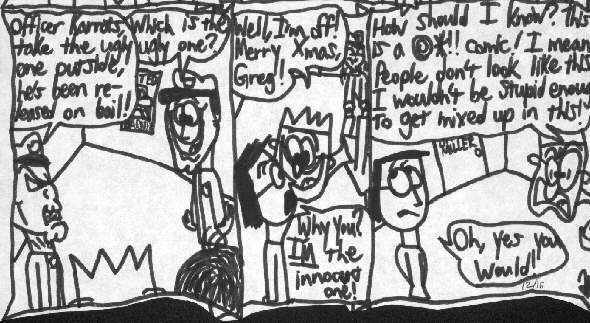 Of course, this strip explains Adam's seemingly mysterious disappearance later on. This is the first appearance of Officer Karrots, who had a "major" role in "The Case of the Stolen Credit" storyline. Also in this one, we finally get to see Adam's "dramatic" side.